This is a list of the National Register of Historic Places listings in Howard County, Maryland. This is intended to be a complete list of the properties and districts on the National Register of Historic Places in Howard County, Maryland, United States. Latitude and longitude coordinates are provided for many National Register properties and districts; these locations may be seen together in a map. There are 42 properties and districts listed on the National Register in the county, including 4 National Historic Landmarks. (#78001470) North of Savage at 7912 Savage-Guilford Rd. (#72000582) Spanning the Little Patuxent River near the junction of Gorman Rd. and Foundry St.
(#14001042) 12280 Folly Quarter Rd. 39°15′22″N 76°56′14″W﻿ / ﻿39.2561°N 76.9373°W﻿ / 39.2561; -76.9373﻿ (Carrollton Hall) Ellicott City Now the Shrine of St. Anthony. (#07000567) 2937 Jennings Chapel Rd. (#78001469) North of Guilford at 6800 Oakland Mills Rd. (#01001374) 5100 Dorsey Hall Dr.
(#90000635) 5730 and 5741-5745 Furnace Ave., 5735 Race Rd. (#86001019) 3412 Folly Quarter Rd. (#12000845) 12301 Howard Lodge Rd. (#84000412) 6036 Old Lawyers Hill Rd. 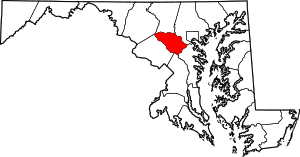 (#93001000) Area surrounding Lawyers Hill and Old Lawyers Hill Rds. and Elibank Dr.
(#00001506) 13370 Brighton Dam Rd. (#14001041) 16449 Ed Warfield Rd. (#74002251) Southwestern corner of Foundry Rd. and Washington St.
(#77000698) West of Ellicott City at 4130 Chatham Rd. (#83002953) 9254 Old Annapolis Rd. Wikimedia Commons has media related to National Register of Historic Places in Howard County, Maryland.